Disney's Jungle Cruise is currently in production. In order to celebrate filming moving right along on the new Dwayne Johnson blockbuster, the studio decided to have a little fun by releasing a video of The Rock with his co-star Emily Blunt. The two are hamming it up with one another on set in a light-hearted, comedic video that showcases their chemistry with one another. If this is any indication, Jungle Cruise could wind up being a lot of fun. This latest Disney movie is going to be a period piece, as evidenced by the outfits the two stars are sporting. Dwayne Johnson looks like he could be getting ready for a role in a 1920s period musical, and it totally works. Johnson jokingly messes up Katherine Hepburn's name while trying to cite The African Queen as a source of inspiration for the movie. He and Emily Blunt boast that this will be "the adventure of a lifetime." That remains to be seen, though, this does seem to have a lot of potential. 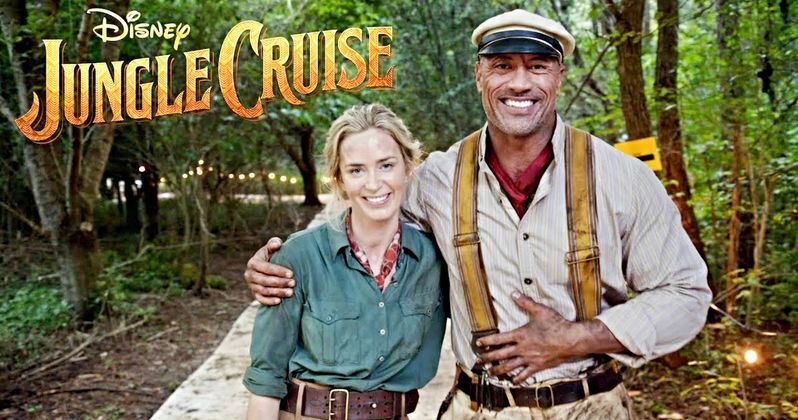 In Jungle Cruise, The Rock plays a boat captain who takes his sister (Emily Blunt) and her husband (Jack Whitehall) on a mission to find a tree that is said to possess special healing powers. Edgar Ramirez (Gold) is on board as one of the movie's villains. He plays a character with a conquistador background who happens to be leading a competing German expedition. Jesse Plemons (Game Night) is partnered up with Ramirez as one of the movie's bad guys. This is based on the popular Disney theme park attraction which originally debuted in 1955. This follows in the footsteps of similar theme park ride adaptations such as The Haunted Mansion, Tomorrowland and, by far the most successful example, Pirates of the Caribbean. Related: Disney's Jungle Cruise Character and Story Details Emerge? Jaume Collet-Serra (The Shallows) is on board to direct. He was in talks to possibly direct Suicide Squad 2 for Warner Bros., but opted instead to tackle this for Disney. And it's easy to understand why. Even though Dwayne Johnson's most recent movie Skyscraper underperformed at the box office, he's still the biggest star in the world right now and Disney has a ridiculously great track record with blockbusters. Plus, Emily Blunt is coming off of A Quiet Place, which is one of the biggest hits of the year so far. Overall, it's an attractive package. This is just the next stop on a never-ending series of projects for Dwayne Johnson. After this wraps up, he's off to film the Fast and Furious spin-off Hobbs and Shaw with Jason Statham and then it's on to Jumanji 3. Emily Blunt is going to be seen this December in Mary Poppins Returns as the titular, magical nanny, finishing up what should be a huge year for herself. Jungle Cruise is set to arrive in theaters on October 11, 2019. Be sure to check out the new video, courtesy of the Disney Movie Trailers YouTube channel, for yourself below.